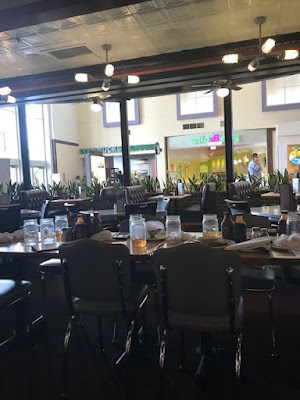 I'm back and it's "T time" again......and time to link up with Elizabeth and the T-gang to show off our drinks and or foodie things. 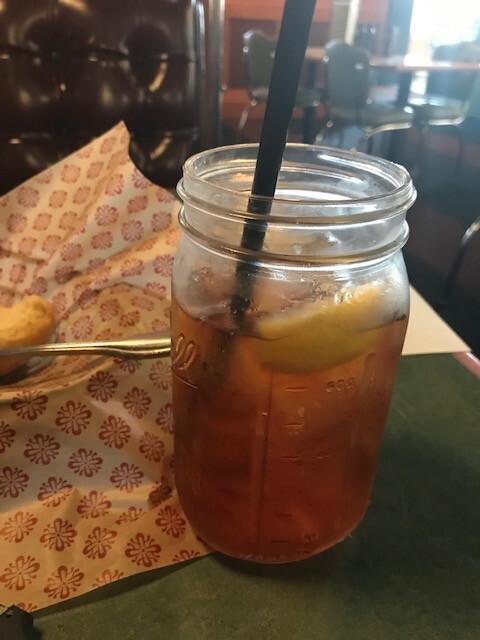 My drink, this week, is a tall glass of iced tea....with lemon. I had to visit the mall to have my rings checked (for insurance purposes) and cleaned. 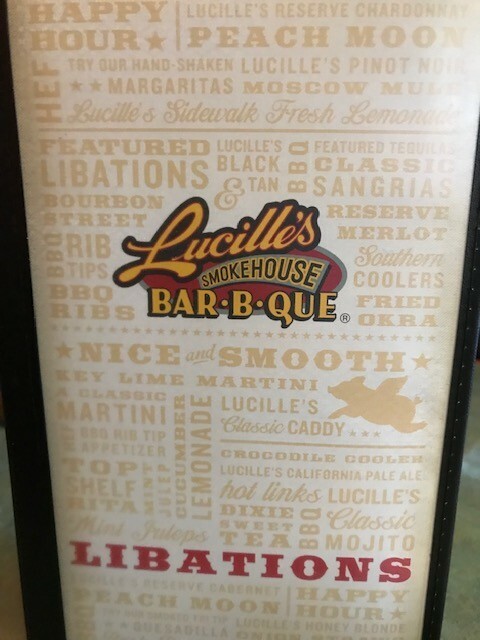 It really doesn't take long, but I decided to walk down to Lucilles Smokehouse Bar-B-Q and have lunch as I waited. I didn't have any Libations, just iced tea, but I like the looks of the drink menu, and I had forgotten to take a photo of the entrance. 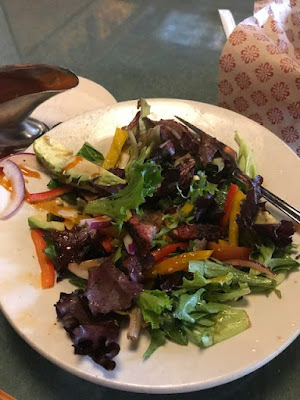 I ordered a tri-tip salad with the dressing on the side. The dressing was interesting, as it had BBQ sauce in it. I finally figured out what it reminded me of. The old fashioned French dressing with BBQ sauce added. That is as close as I can get to describing it. Most people out-side of California do not know what tri-tip is, but it is VERY common here. It is a junk meat that the Hispanic workers learned to cook and make tender and tasty. It is one of my favorite cuts of beef.......right after a good steak LOL! Lucille's is open to the mall, and sits just inside the main entrance,I had to wait for the large party at the next table to leave so I could get this photo. 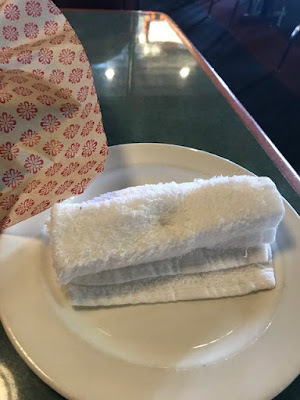 While I was waiting for them to leave the waitress brought me a hot, wet towel to get the sticky off my fingers.......this is part of their meals. Even though I only had salad, and only used my fork, I still managed to have sticky fingers and enjoyed the wet towel. 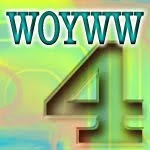 Surprised at the new new blog name and layout? 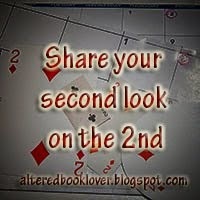 My last post explains what and why it all happened, so if you missed it you might want to check it out. Thank you for explaining your salad as i have never heard of it before. Nice of them to have a nice wet towel at the ready after having something sticky:) Your new blog is looking good- I should probably be updating mine too but don't have the skills to do much with it:( Happy T day! I've never had tri-tip, but I have seen them in CA bar-b-que restaurants. So glad you explained it to the T gang. Did I see avocado in your salad? Loved the libations drink menu. And ice tea with lemon sounds good, except it is far too cold for that here at the moment. Thanks for sharing your tea and tri-tip salad with us for T this Tuesday. Are you getting all that rain, too? My friend Joseph told me he got an e-mail because he has a PO box in Malibu that the water from the rain was getting dangerously high. It looks a delicious salad, thank you for explaining the meat to us, its certainly something I've have never heard about in the UK. Your iced lemon tea sounds lovely and refreshing. It's nice to see you at T again, Krisha. I've never heard of tri-tip steak but didn't know exactly what is was. The salad looks delish! Your salad sounds and looks delicious! Bbq dressing would be something I like. I have not heard of tri-tip but if I ever make it to Cali I will definitely give it a try. Tender, juicy beef is something that I am always up for. Oh, and the hot towels are a wonderful edition to the meal! Not one likes to leave with sticky fingers. I'm in Memphis so was excited to see a BBQ post :) A hot wet towel should be standard in _every_ BBQ place! Wow- that looks a delicious salad Krisha! But please no tri-tip for me at all. It sounds like a great pace to eat! Love your new blog name.